It's been a long time coming but UK buyers will be hoping it's been worth the wait when the Chevrolet Camaro finally goes on sale here at the beginning of 2012. And the big news is the price - at just £34,995 for the Coupe and £39,995 for the Convertible it looks incredibly value given the power and equipment it has. The retro-styled muscle car is fitted with a monster 6.2-litre V8 that develops 432PS and has suspension set-up that has been fine tuned for European roads. The one fly in the ointment is that it's left hand drive only, although that looks a small price to pay for the performance and sheer road presence the Camaro offers. It has actually been on sale in the USA since 2009 and has proved a popular model with more than 200,000 sold but there have been a few issue with it coming to Europe, such as the traditional US style rear light clusters which didn't have separate indicator lights - instead the brake lights doubled as the turn signals. However these have now been sorted and after what seems like an eternity, the Camaro is finally set to arrive in the UK in 2012. It will certainly provide a shot in the arm for Chevrolet's image in the UK which up till now has been more readily associated with value for money cars rather than high performance coupes. All UK versions of the Camaro will be the top specification model, with 20-inch alloy wheels, Brembo performance brakes, full leather upholstery with a six-way power adjustable driver’s seat, a Boston Acoustics nine-speaker audio system, Bluetooth and rear parking sensors. The instrument dials have been calibrated for Europe too. Options will include a choice of premium paint colours, bonnet stripes, interior trim accents, a sunroof, polished alloy wheels and an automatic transmission, which is a £1500 extra. Chevrolet announced the Camaro pricing at the Goodwood Festival of Speed, where the car was the centrepiece of the American firm’s centenary display. 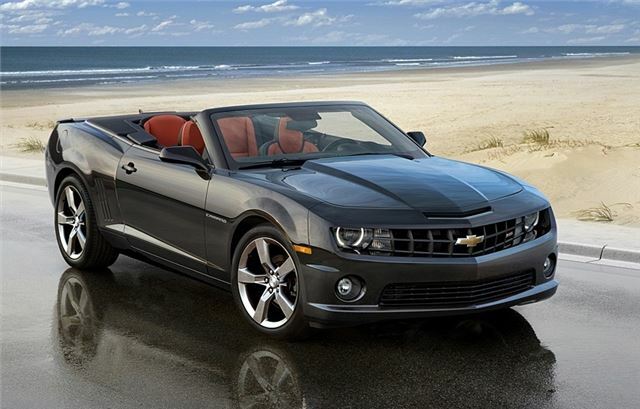 Customers wishing to order a new Camaro, or who wish to find out more, should register their interest by phoning 0800 666222 – calls are free from UK landlines.